Protesters will demand more working hours, higher wages and an end to punitive actions against Walmart workers. OUR Walmart, the group behind last year’s Black Friday activism, has promised even more actions this year with 1,500 protests scheduled at stores all across the country. Walmart is clearly nervous ahead of this year’s plans because the company has asked judges in Maryland and Florida to bar protesters from entering stores on Black Friday. “This is yet another move from Walmart to try to bend the law to its liking. Walmart has made it a practice to pursue over-the-top legal maneuvers to try to avoid hearing the real concerns of workers and community members,” said Derrick Plummer, spokesman for the organizer, Making Change at Walmart, in a statement. “Workers are calling for an end to illegal retaliation, and for Walmart to publicly commit to improving labor standards, such as providing workers with more full time work and $25,000 a year. As the country’s largest retailer and employer, Walmart makes more than $17 billion in profits, with the wealth of the Walton family totaling over $144.7 billion—equal to that of 42% of Americans,” the group said in a statement. Goytia is a member of Organization United for Respect at Walmart (OUR Walmart), which is backed by the United Food and Commercial Workers union. He has taken part in several protests for better wages and working conditions at the store, including one in early November, when fifty-four people were arrested during protests at a new Walmart store in Los Angeles. 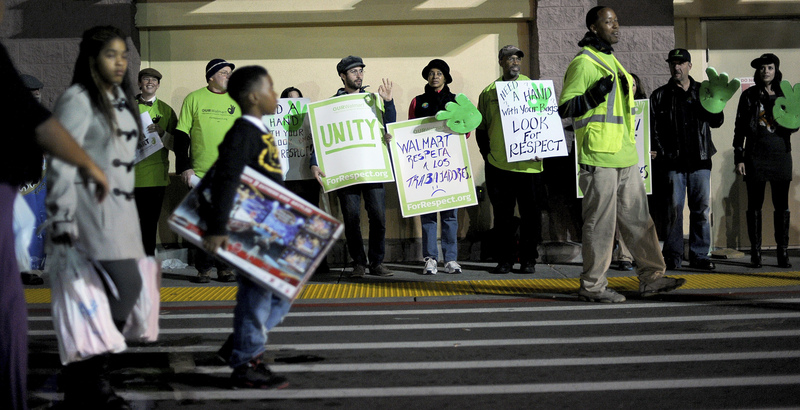 But worker actions against Walmart aren’t isolated to Black Friday. On Monday, Representative Keith Ellison (D-MN) joined Walmart workers in Minnesota who walked off the job, and in Los Angeles, workers went on a two-day strike that culminated in the largest-ever act of civil disobedience against Walmart. Last week, workers in Seattle, Chicago, Ohio and Dallas joined them in walking off their jobs. Additionally, Walmart workers at three Washington, DC, area stores went on strike Tuesday, calling on the company to end its illegal retaliation against workers, and calling for better wages and full-time work. Since June, Walmart has illegally disciplined more than eighty workers, including firing twenty worker-leaders, and more than 100 Unfair Labor Practice charges have been filed with the National Labor Relations Board (NLRB) against the company. Recently, the NLRB regional office announced it found merit to OUR Walmart’s charge, and found Walmart committed eleven violations of national labor law. At a time when workers are struggling to survive on low wages, activists expressed outrage at the retirement pension of Walmart CEO Mike Duke, which at $113 million, is more than 6,200 times greater than the average worker’s pay. “Walmart should be ashamed of the vast labor mismanagement under CEO Mike Duke. From the low wages at Walmart stores to dangerous working conditions in warehouses and the inexcusable safety conditions in factories in Bangladesh and other countries, as the world’s largest employer, Walmart can and should do better to create good jobs and safe working conditions,” Sarita Gupta, executive director of Jobs with Justice, said in a statement. I will be live-tweeting from Black Friday actions in New Jersey. Follow me on Twitter @allisonkilkenny. Wages for Walmart workers are so low that one retail outlet in Ohio held a food drive for its own employees.